Does anyone remember the band Vortex who used to play The Barrel Organ round about 1979? Stuart, you were going out with Judith Williams, your lead singer was addicted to some cough syrup or similar, you had a song “Just a machine in a factory” – did you have Nick Millward on drums? ? ? Re. Stuart’s question. I recall being intrigued by the name “Vortex”. I heard them listed on BRMB’s gig guide, read out by Robin Valk. Sorry to say I never went though.I think they were from Solihull but maybe that’s wrong. What style of music were they? Did they release anything? I played bass for Vortex! I suppose we’d be described as New Wave now, but at the time we just did what we did! Played here with my band HELTER SKELTER BACK IN 1981/82, sawa few goods bands there, great venue, well it was.. I first went to the barrel at age 16 1986 such great nights and never forgot he place. The mix of folk in there was great, being a metal head, ahem, I always loved the fact that on the DJ nights you would have all the rockers, indie lot, crusties, goths etc dancing together – I never saw any trouble…..And the cheap scrumpy was a godsend – having not much money around then…. A fantastic, yet dark and atmospheric place…. I remember evryone was gutted when the closure came, and there was a live band/protest/rally outside – but it had little / no impact…. Oh well…….Then we spent more time at the Pen + Wig + Sinatras (Which itself was great for the HC shows…)…If only we could go back in time. 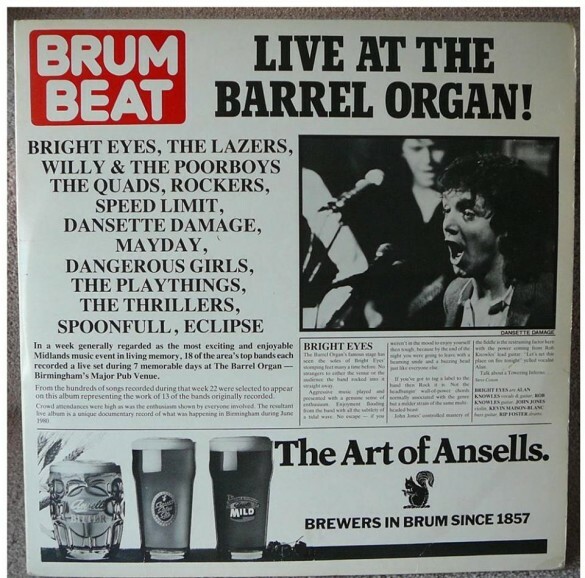 U2 played the Barrel you know. My mate Liz attended this gig I was somewhere else. Always wondered what became of them! Guyana Batz , several times, Colbert Hamilton & the Hellraisers, Terry & Gerry, and many more. I first saw Brum’s answer to CBGBs in about 1989.I’d be interested to know if anyone saw the Manics there in ’91.Any pics would be fantastic to see or LIVE footage Wow.Or Stories even. I saw them in 91, I think it was a Wednesday night, went down for a pint with my mate and they happened to be there. I had never heard of them and the place was almost empty about 20 or 30 people there at most. We actually went and sat in the other room so we could have a chat. Cant remember what night it was but I thought it was was quite full. The fella on the t-shirt stall asked us to look after it while he went for a s***. When he came back he told us where the band would be after the show. We met them..very quiet blokes. I don’t think the lead singer was there though. Ritchie had just cut his arm up. He stills signed my mates record though. I nicked a poster out of the pub window and they signed that as well. Good times.